← NBA Playoff Recap 5/28: The Final Stand. What’s next for the New Jersey Nets? With new Russian owner Mikhail Prokhorov, the Nets are going in the right direction. Looking to move from New Jersey to Brooklyn and hopefully become the first international team. With the Number 3 pick, which would probably be Derrick Favors. And alot of cap room enough to sign a max agent.This team will be doing fine especially with Devin Harris and Brook Lopez. Hopefully, they’ll get the right coach. Expect them to get some like Mike Fratello or Avery Johnson. As for their cap space of over 15 million, it’s enough to get a max agent (It maybe someone like D-Wade, Lebron James, Carlos Boozer, Joe Johnson and Chris Bosh just to name a few.) and surround the max agent with role players who have playoff experience. As for their playoff aspirations as Mikhail said “If everything goes according to plan, playoffs this year and championship will be in a minimum 1 year to a maximum 5 years”. Now their owner Prokhorov, the 59th richest man in the world is still a mystery wanting to be known in the US, he bought the Nets and is now trying to turn this franchise around, Hopefully this franchise is heading the right direction and hopefully will have a better record than last year (12-70). 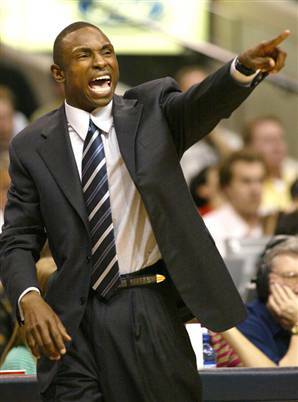 As for their coaching candidates, they are looking at Avery Johnson and Mike Fratello. Strengths: Avery first of all is a winner. 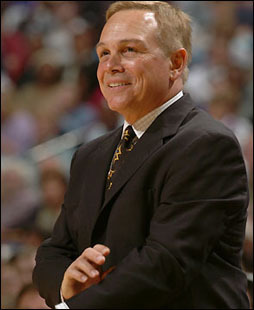 He emphasizes defense all the time, leading the mavericks to 50 win seasons and 2 60 win seasons. Avery’s gonna bring mental toughness and a defensive mentality, which drastically will help the Nets because they were horrible at the defensive end. Offensively, its gonna be run-and-gun, which is fun to watch like when he was coaching the Mavericks giving the ball to Dirk and let him operate. It would also be a coincidence since he’ll be reunited with Devin Harris, who was his Point Guard for 2 years and now is a one-time All-Star. It could be interesting. An impressive track record of 194-70. Weaknesses: It’s a short list, but people question his leadership after they lost to Miami in 2006. And the disastrous series against the Warriors in ’07, losing the series embarrassingly. Especially with championship aspirations that season. Strengths: This guy is also a winner. Coaching the high flying hawks in the 1980’s with Dominique Wilkins and Spud Webb. He has alot of playoff experience; also an excellent teacher , who emphasizes in offense and defense. He is a respected coach and can help any team. He currently works in TNT. He is an intelligent person knows how to approach a game. If it helps, his record 667-552 is pretty good. Weaknesses: A short list too. The only question for Mike is can he get over the hump. Can he lead the Nets to a championship, who knows? Don’t forget to comment down low. Subscribe to us via RSS! Hoops Head Central is an online blog devoted to the latest NBA news. We bring you everything that all that is talked about from the National Basketball Associoation. Yes, this is an NBA blog (as mentioned above), which brings you, the NBA fan, a gamut of NBA news. HHC may not be a household name, but if you stick with us, then we assure you that you’ll get impressed. We are men of our word. Promise! Enter your email address to subscribe to this Hoops Head Central and receive notifications of new posts by email. The Wall and Arenas Connection – Success or Failure? Witnessing The End of Cleveland Basketball? Check Some NBA Stats Out! Momma There Goes That Man!